Many of my friends and family are amazed at how well I can coordinate an entire meal through the use of a campfire as my heat source. Until recently I just told them that I was so good at it because, “Generations of country run through these veins!” Either that or I would look at them and sing, “Red-red-red-red-red-red-neck!” Either way it was amusing for me. Not that either of these isn’t a true statement, but it also helps to practice up a lot when not out in the bush. Now I confess and let them know how to practice. A lot of you might not live in a place where having a full blown fire pit or campfire in your yard is an option. 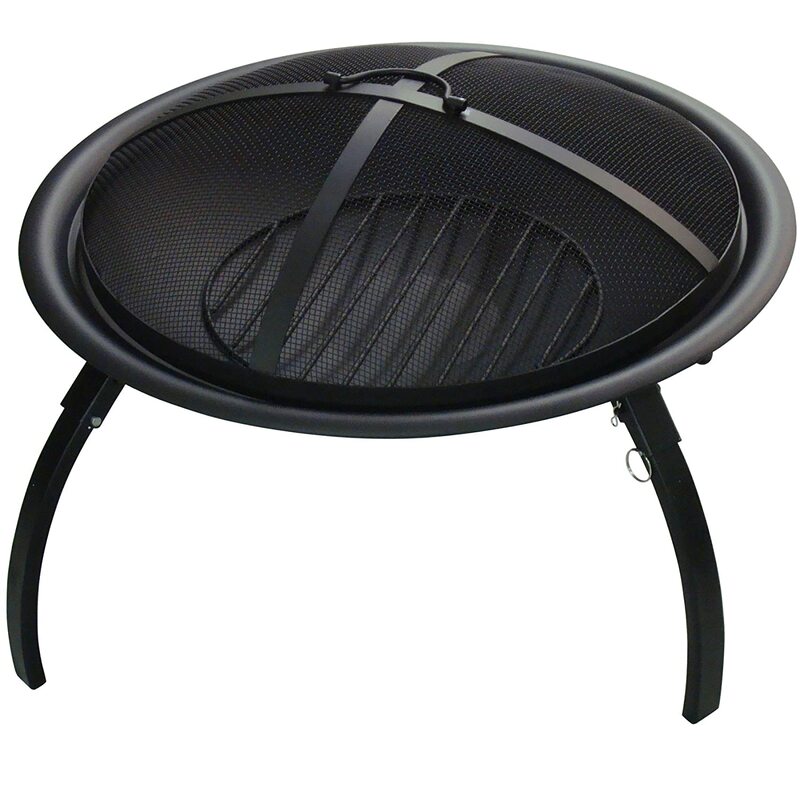 For those of you who want to practice up, but don’t have the facilities, can use one of these type fire pits. Cook some steak to medium rare or some brauts to a point right before they are truly cooked. Pour some drained, baked beans into your Dutch oven. Add some spicy BBQ sauce to the bean. Add enough to make them a little bit soupy. Cut up whatever meat you previously cooked. Make sure it is in small pieces. We are talking smaller than a bite. Add this to the beans. Toss in some cut up bacon. Cook to the point where the bacon starts turning color. Add some biscuit mix (mixed up of course) to the top. You can also mix flour, a table spoon of baking powder, salt, and enough water to make it into a batter, then pour it on top. Either way, it needs the biscuit type material on top. Cook it the rest of the way. If you added the biscuit type layer after the bacon had already started cooking, everything will get done at the same time. Take flour, a table spoon of baking powder, sugar, cinnamon, and enough water to make it into a biscuit type mix. Cook it like you see in the picture below. As you can see, I took some foil and put it over some tree bark. You can put it right on the bark if you want, but expect a bit of dirt that way. I did the foil because my wife was eating with us and she complains about the dirt and grime in her food. 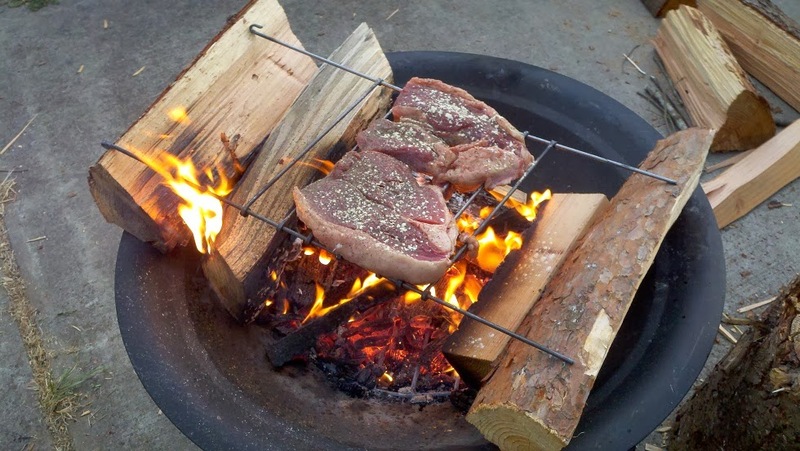 If you are not sure how it should look when you are cooking your steaks, check out this picture. 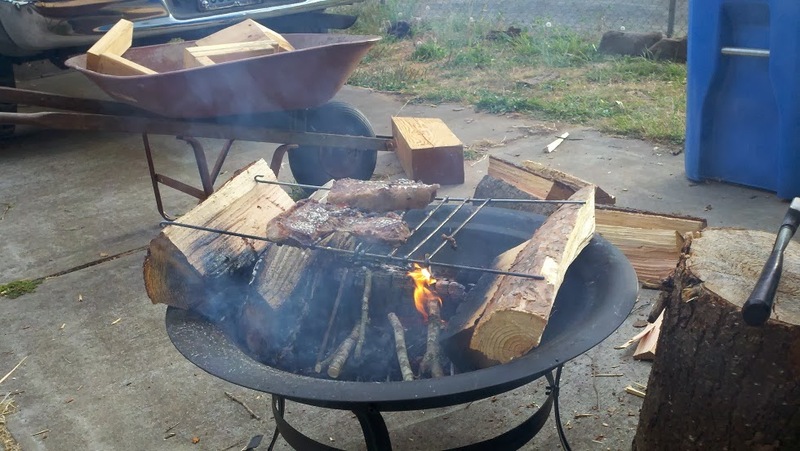 Cooking steak over a fire pit. 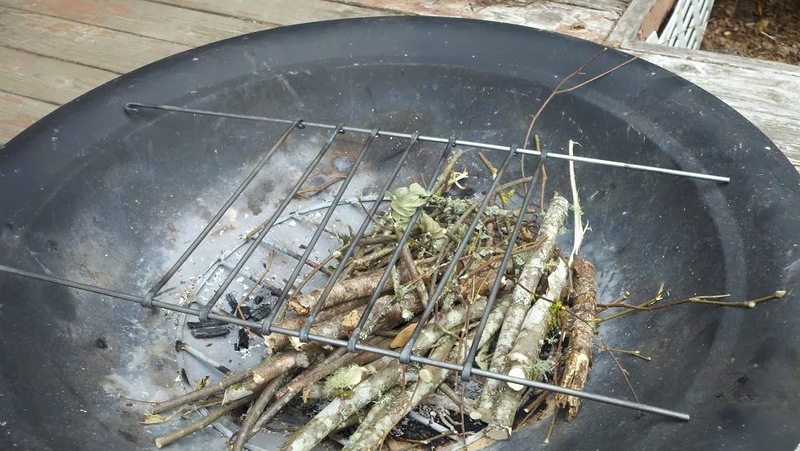 When you get a bit more experienced, you can even cook with a pot over the fire pit. 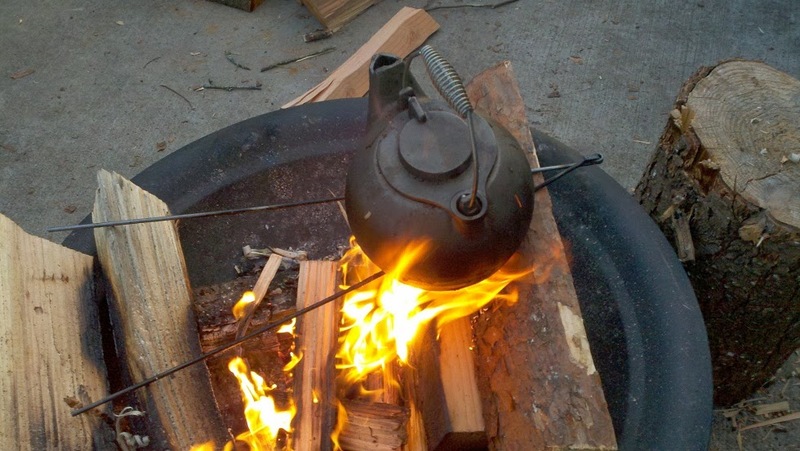 Just take some metal rods to make yourself something like the following to put your pot over. I wasn’t cooking with the pot, but wanted to give you an idea of what it would look like with the fire pit. 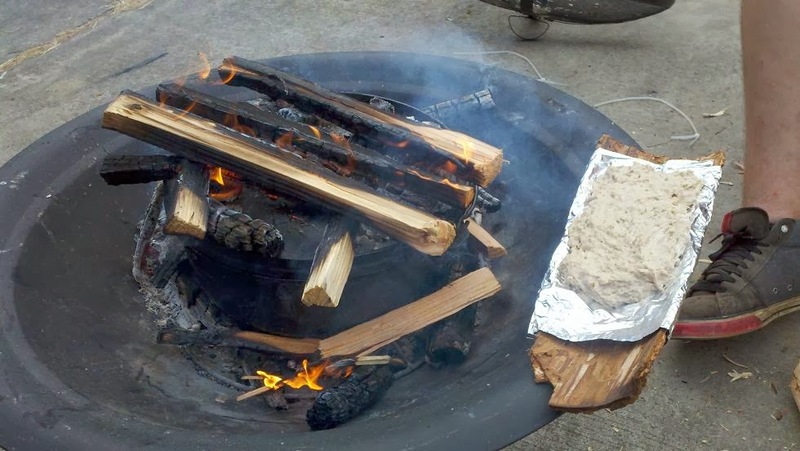 As you can see, the only limitations on how to cook with one of these fire pits is your imagination. We have had ours for several years and have put several cords of wood through it. During the summer we use it at least three times a week and cook with it about half the time. We use it during the winter as well, but only two to three times every couple weeks. Still, it is enough to get good at open flame cooking. Teach my family how to cook over open flame. 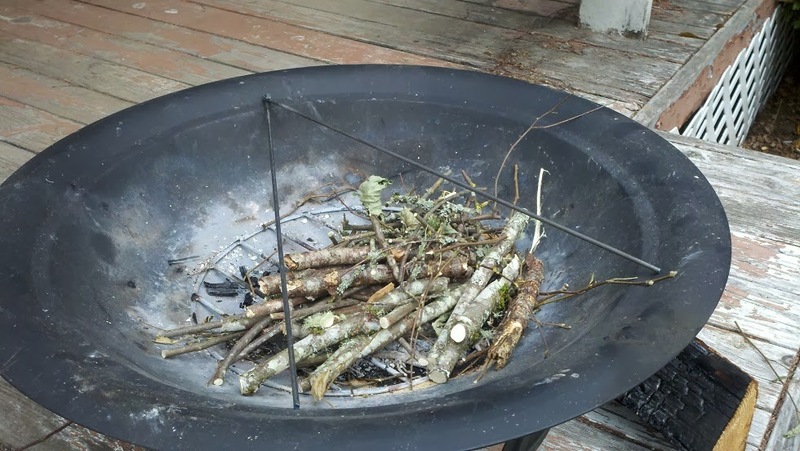 Teach all my family how to build a camp fire. 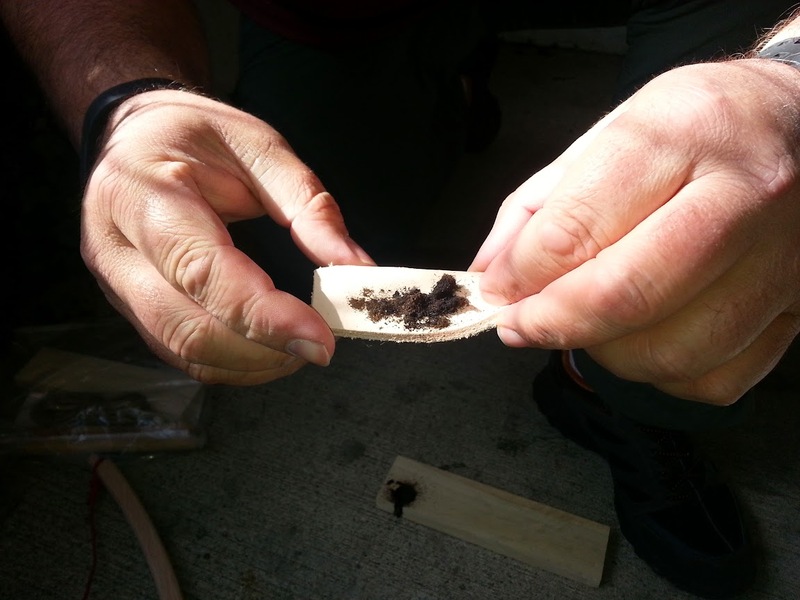 Teach my son how to do flint and steel fires as well as friction fires. Spend countless hours of quality time with my family. 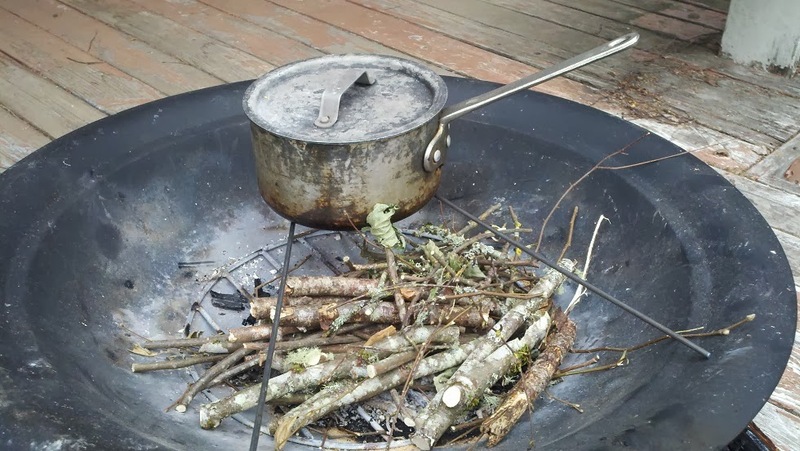 This entry was posted in Camp Techniques, Miscellaneous and tagged bannock, camp cooking, campfire cooking, campfires, campfires at home, cooking, cooking over fire, cowboy casserole, fire pit, home fire pit on August 8, 2014 by Woodsbum.